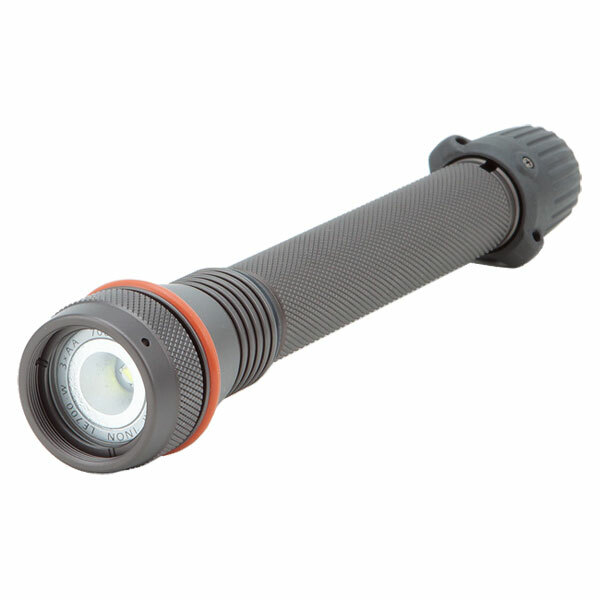 Ample features as primary lighting source for photography/videography with powerful 700 lumen and wide 75 degree coverage as well as diving light to illuminate wide area for cave or wreck diving. The LE700-W is equipped with white LED chip with enhanced color reproducibility to deliver color temperature 5000K and carries specially designed reflector to produce wide and even coverage with natural beam pattern where light is gently diffused around covered area. Ideal for photography and videography with its light quality. The LE700-S comes with "Red Filter LE" not to stimulate shy underwater life by changing light beam color to red. The LE700-W runs on easily obtainable 3 x AA size batteries. Practical burn time with eneloop pro rechargeable batteries is rated approx. 75 minutes(*). Using compatible rechargeable batteries like "eneloop" enables you to share same battery charger with an INON strobe to enhance mobility and minimize your luggage space. The light head and battery box is made from seawater-resistant aluminum alloy. Simple yet durable construction with double O-ring for moving parts supports depth rating 120m. The independent rotary switch part is equipped with a stopper to prevent accidental flooding due to over loosening and reliable ON/OFF operation. Gold coating on electrical contacts of the light head and battery box provides maintenance free circumstances under normal usage. Interchangeable Light Head design enable you to use "LE700-S Type2", "LE700-W", "LE700-S", "LE550-W", "LE550-S", "LE350", "LE250" Light Head depending on usage and supports possible upgrading to future model as well. Depth rating 120m / 394 ft. Arm System Please refer to accessories. Materials Corrosion resistant aluminum alloy / rigid almite, PBT, Optical grass etc.